The most striking images coming out of the Iran human rights protests are not of men – they are of women. And while American media was slow and even hesitant to pick up that anything at all was actually happening – this, while protests ignited for what is now six full days around Iran, nine years after the Green Movement protests began – Twitter was flooded with videos and photos on the ground, in defiance of the Iranian regime’s social media policy. Almost none was more striking than a young Iranian woman standing atop a container and shedding her hijab – a garment mandated and enforced upon her and all women in Iran – while simultaneously waving it as a flag. It was an act of defiance much like that of the Iranian chess champion Dorsa Derakhshani, who was expelled from competition in Iran for refusing to wear a headscarf in competition. There were unconfirmed reports that the unidentified girl was taken into custody and the spot where she stood had become a makeshift shrine, but because of the scattering of information on the ground there’s no way to confirm that. Nevertheless, she became an immediate symbol for the growing movement now in its fifth full day. Twitter avatars were changed to an illustration capturing the moment. The drawing was spread on Facebook. But she wasn’t the only one. Another video spread on social media shows a woman confronting security forces and proclaiming “Death to Khamenei” while crowds around her join in. Mind you, this wasn’t inauguration protests from January of last year with celebrity activists screaming freely into microphones about how much they’ve thought about blowing up the White House. This was a woman endangering her life and possibly the lives of her loved ones to stand up to government forces of a hardline Islamic theocracy. She was risking death. And yet, nevertheless, she persisted. 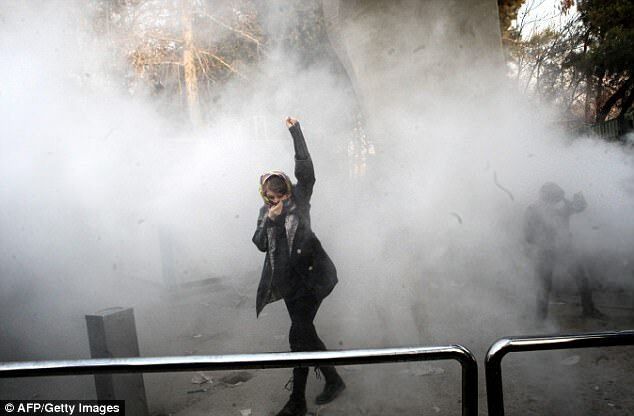 Another image that managed to make its way into some mainstream coverage shows a young woman – reported to be a student – covering her face as she runs from tear gas just outside the University of Tehran, her fist raised defiantly in the air. She was a symbol of a growing secular youth movement merging with thousands of others protesting the regime’s involvement with Hezbollah, Hamas and Syria. And as the protests entered their fifth night, another striking video on Twitter shows a woman demanding fair wages and an end to regime attempts to silence them. Women reportedly led protests in the city of Isfahan. Every one of these searing images are of women. Women are the predominant face of this blossoming revolution. Women are risking the most to speak out against the Iranian Mullahs. So the question must be asked: Where are the women’s movement supporters in the United States and Europe, which gathered en masse to protest a newly inaugurated American president last year? More specifically, empowered by the cultural muscle of #MeToo celebrity leaders and Women’s March organizers such as Linda Sarsour: Why are you silent? If these nameless women can speak out in the face of true tyranny, risking actual imprisonment and death, why can’t you? Iranian women are not adorning pink knitted hats, or costumes resembling female genitalia. They won’t be attending award shows. They aren’t wearing red cloaks and bonnets inspired by their favorite Netflix show. No, these brave women are caught on videotape and in photographs for the world to see, and the women’s movements have yet to barely offer so much as a tweet or a Facebook post of support. The official Women’s March Twitter account has tweeted exactly zero times in support of women protesting in Iran. Zero. What seems to be lost on Ms. Sarsour is that these women are currently risking their lives and protesting – not for the right to come to the United States – but for the rights to live and thrive in their own country. I do sympathize with Sarsour and the women’s movement of the political left and their sudden predicament with supporting these brave women. Women in Iran are shedding their hijabs while progressive women’s movements in the United States try to hold them up as a symbol of empowerment and feminism – going so far as Shepard Fairey-esque illustrations attempting to mainstream the hijab into pop culture. What’s empowering about the hijab is the choice to don one. Muslim women in the United States have that choice. Women in Iran do not. If these pro-women groups are all about choice for deprived women around the globe, now would be a good time to speak up on behalf of them. Women in Iran are standing in defiance of the regime’s financial support of Hezbollah and Hamas rather than fair wages and human rights. But for progressive women’s groups to oppose Hamas in the face of these protests, it would mean abandoning months of pro-Palestinian support, capped off last week when pop singer Lorde cancelled her Tel Aviv show. Sarsour, as a self-professed leading advocate for Muslim women in the United States and around the world, should be asked to clarify her position by journalists who are all too eager to present her with awards and speaking gigs: Does she support the women of Iran or the hardline theocracy that is currently brutalizing them? Remaining silent in the face of this growing movement is another black eye for Sarsour in particular, who is facing charges of ignoring complaints of sexual abuse while she was director of the Arab American Association. Of the prominent supporters for progressive women’s movements in Congress, only Bernie Sanders has offered measurable support for the protestors, tweeting, “It is the right of all people to speak out against their government. The government of Iran should respect this right and heed the voices of thousands of Iranians who are demonstrating across the country for better opportunities and a better future.” Not hard stuff. Chuck Schumer found time to tweet out support of the New York Giants football team keeping quarterback Eli Manning, but not for the women now splashed across news services worldwide. Senators Elizabeth Warren, Kamala Harris and Kirsten Gillibrand – leading progressive women’s rights advocates all – have not only not released statements in support of these women, they’ve said nothing in support of the protests at all. Not a press release. Not a tweet. Nothing. Hillary Clinton has not offered support of the women beyond a tweet stating she hopes “their government responds peacefully and supports their hopes.” Hate to break it to the onetime self-declared ceiling breaker, but the government is very much not responding peacefully nor are they supporting their hopes. They are, indeed, emboldened financially by an Iran Nuclear deal she herself claimed partial credit for. Powerful women in entertainment have never been hesitant to raise their voices and organize in support of their personal beliefs. And today, because of the #MeToo wave, they have never been more influential in politics or culture. Yet they remain silent. First Lady Melania Trump and Ivanka Trump could also certainly publicly show support, but would the left then just simply write off joining them? Political support for the women of Iran would of course contradict the careful echo chamber narrative Democrat politicians spent months crafting in support of President Obama’s nuclear deal with Iran – which is in fact a major reason for the uprising happening now. The Mullahs squandered most of their financial windfall from the Iran deal on support for terror groups such as the Assad regime, Hezbollah and Hamas after promising to invest it in the people at home. The people of Iran have had enough of these empty promises. More importantly, the women of Iran have had enough and are leading the way, with or without public support from the self-declared women’s groups on the left around the world, who have decided they are the public voice of resistance for women – except in places where a collective voice of support could actually help women the most. Their ideas of empowerment apparently stop where their politics start. Despite a world attempting to rationalize looking away, a solitary woman stood up in defiance of the rule of law, risked her life and removed her head scarf. She did this at the risk of arrest, or death. She did this without public support from women’s groups who claim their entire existence is to support this very act of defiance. While they remain silent, I’m with her. One assumes that U.S. liberals think being on the side of Barack Obama and his disastrous Iran policy is more important than being on the side of oppressed Muslim women. And apparently we can also conclude that Iranian men are either cowards or perfectly fine with being less oppressed than Iranian women are.